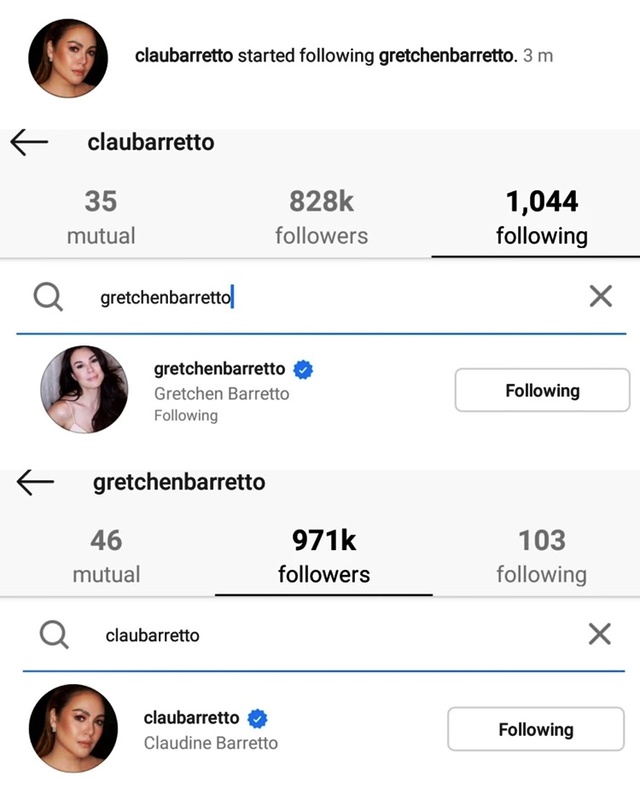 Claudine Barretto follows sister Gretchen on IG. CLAUDINE BARRETTO – The “Optimum Star” Claudine Barretto follows her estranged sister Gretchen Barretto on Instagram which earned comments. The eagle-eyed netizens were able to find out that Claudine Barretto followed her sister Gretchen Barretto Instagram account after some several years. As much anyone is probably aware, they are estranged to each other because of their differences and some issues as siblings. Get Rid of all People who tries to Control & Manipulate u.dont allow people to manipulate you & destroy or steal your Joy.NEGATIVITY IS CONTAGIOUS.Dont allow people to be comfortable in Disrespecting u & pretending that they didn’t do anything. It was last 2013 when the Barretto family got divided due to battle of Claudine with estranged husband Raymart Santiago. Since then, they were not talking to each other seemingly cutting ties. However, the estranged sisters have indirectly defended each other on several occasions. Gretchen defended her younger sister when someone boy-shamed her while Claudine defended Greta on issue about having an affair with businessman Atong Ang. And now, just recently, it has been reported that that Claudine followed her sister on Instagram after she was dragged on her issue with Kris Aquino. Despite the controversies, this has brought happiness to some people as it has ignited speculations that maybe they are patching things up, after all, they are sisters and blood is always thicker than water. All’s well that ends well. Blood is thicker than water. Sana magtuloy tuloy na ang pagkakaayos ng pamilya nyo. Kailangan nyo ang isa’t isa, more than anybody else. I’m happy for you. They followed each other na so feeling ko baka nag usap na sila. If not in person, baka sa DM. We can only speculate for now kasi wala pang post na magkasama ulit sila. Not bad, I think they’re more matured now handling their differences and strong personalities.